A compilation of at least 30 published studies based upon satellite and ocean observations demonstrate climate sensitivity to a doubling of CO2 levels after all feedbacks is only about 0.5 C, which is ~7 times less than the 3.2C claimed by the IPCC AR5 modelled mean estimate. Note: If the current rate of increase of 2 ppm/yr continues, CO2 concentrations would require about 200 years to double. These climate sensitivity estimates also assume the temperature increase was solely due to greenhouse gases and do not include natural influences from solar amplification, global brightening, ocean oscillations, etc. which can alone account for 95% of climate change over the past 400 years. Note: Equilibrium climate sensitivity [ECS] at the top of the atmosphere [TOA] has been determined from the above analyses assuming ECS is 130% of transient climate sensitivity [TCS] per Otto et al. Why is Bentgsson listed here at 0.54C but on an earlier page, http://hockeyschtick.blogspot.com/2013/08/new-paper-finds-low-estimate-of-climate.html, listed at 2C with a lower bound of 1.167C? Here are a few more not included on the list. 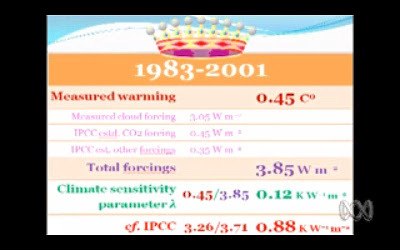 Human sensitivity is .0004C/ppm. If "doubling" is considered to be 700 ppm then it would be 420 ppm (120+300) x .0004 = .168C. Pretty much with Willis. Taking this assumption at face value, in 1850 CO2 was responsible for about 6.44C warming above 255K equilibrium temperature [32.2C * 0.2], and CO2 responsible for about 6.6C warming now [33C * 0.2], since the globe has only warmed 0.7 to 0.8C since 1850. Thus, a ~43% increase in CO2 allegedly responsible for 0.16C warming, about 12 times less than claimed. As I have previously written, the Australian Government has failed to pay due diligence in studying what is a completely false claim that carbon dioxide supposedly warms Earth's surface. In that the Dept of Environment has not investigated the very valid physics which I present, nor even asked any physicist to contact me or discuss the matter, I propose soon to place a display advertisement in "The Australian" newspaper calling for funding from large companies who will be adversely affected by carbon trading in order to pursue legal advice pertaining to a possible High Court challenge against the Government. In the meantime I would suggest you heed this brief outline and perhaps read my book, copies of which have been sent to some of you. I write based on very extensive research over recent years and experience in physics dating from the 1960's when I won a university scholarship and got my first degree in such. I suggest an enquiry should be initiated and I am happy to attend gratis. Climate models disregard the gravitationally induced temperature gradient and assume it doesn't exist, despite the science first presented by the brilliant 19th century physicist, Josef Loschmidt who was first to estimate the size of air molecules. The models also assume that the radiation from the cold atmosphere delivers nearly twice as much thermal energy to the surface as does the Sun. It doesn't, and that's why you don't feel it at night. They also disregard the obvious fact that nearly all the Sun's radiation passes down into the first 20 metres or so of the ocean, where it's colder. There can be no heat transfer from such colder depths in the ocean thermocline back up to the thin surface layer in the non-polar regions, and so that energy only eventually warms the polar surfaces. So the calculations which use all the radiation from the Sun and the atmosphere, added together and used in the Stefan-Boltzmann equation to "explain" the surface temperature are completely false. What does happen is explained in my book, and the mechanism therein can be used to calculate the temperature on Venus and even at the base of the nominal troposphere of Uranus, where it's hotter than Earth's surface even though the planet is 30 times further from the Sun. That temperature has nothing to do with direct radiation from the Sun. All climate follows natural cycles which are very evident in the inverted plot of the scalar sum of the angular momentum of the Sun and all the planets. In that plot (calculated from planetary orbits) we can predict slight cooling till 2028, then 30 years of warming (by about half a degree) and then 500 years of long-term cooling with superimposed 60 year cycles. This plot (below) has been on my http://earth-climate.com website for three years.